Almost a week after an estimated 485,000 women marched on Washington, D.C., to demand equality under President Trump, the Mall was overtaken by a new group of protesters. Anti-abortion activists held their annual March for Life on Friday morning, and although their list of speakers was markedly shorter, it included some big names. Vice-President Mike Pence spoke at the rally, as did a number of anti-choice politicians and activists. Here are some of the things they had to say — and what they tell us about the future of abortion access in a Republican-run America. What it means: Pence’s presence at the march already speaks volumes; he’s the highest-ranking White House official to ever speak at the march in person (Ronald Regan and George W. Bush both called in). And his message to marchers is clear: The Trump administration is on their side and will do everything in its power to restrict women’s access to abortion, including nominating a pro-life judge, just as the president promised. He also said “life is winning in America” about a dozen times, so make of that what you will. What it means: Smith is probably referring to a surgical abortion procedure known as dilation and evacuation, or D&E, in which the cervix is dilated and surgical instruments are used to remove fetal and placental tissue. This type of abortion is endorsed by the World Health Organization because it’s relatively safe. It’s becoming standard practice for ending a pregnancy after 12 weeks, but keep in mind that the majority of abortions (89 percent) occur at eight weeks of pregnancy or earlier. “Dismemberment abortion” has become a buzzy term anti-abortion activists use to drum up outrage — something Smith is perpetuating here. What it means: First and foremost, this is a horrible mixed metaphor. Secondly, Roe v. Wade isn’t fake — it’s federal law. 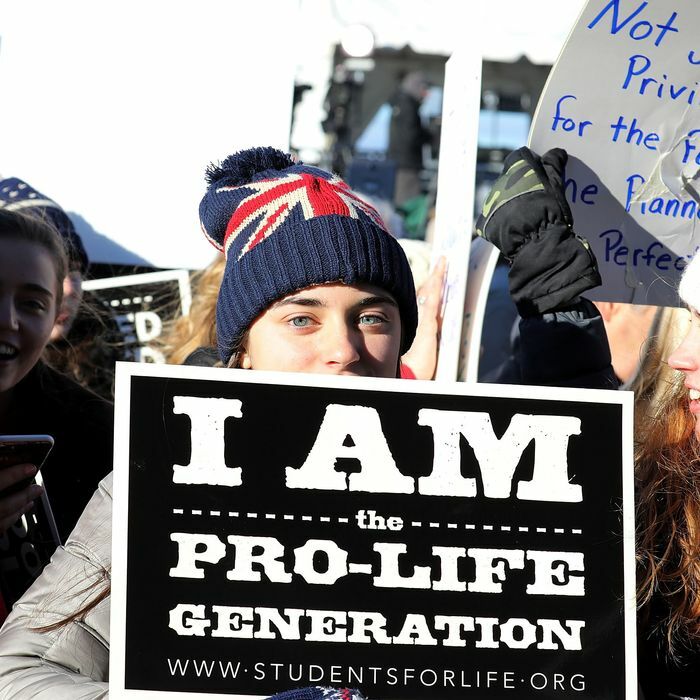 The quote reflects the movement’s desire to repeal the landmark ruling, and with President Trump planning to announce a pro-life Supreme Court nominee as early as next week, the chances of that happening are higher than they’ve been in years. What it means: This statement is, of course, false: For one thing, if a 2-year-old is in a Planned Parenthood clinic, they’re probably pretty safe — unless that clinic is being targeted for violence by anti-abortion protesters. We can only assume Smith meant to say “an unborn child,” in which case he’s also mistaken — according to the National Institute of Child Health and Human Development, the number-one cause of infant mortality is birth defects, followed by preterm birth and pregnancy complications. Incidentally, these are all things Planned Parenthood helps to prevent with its prenatal-care services. Using the term “child” to describe an unborn fetus is a move that’s always been crucial to the anti-abortion agenda, and is likely something we’ll see more of as the Roe v. Wade debate heats up. What it means: In his final weeks in office, President Obama introduced a new rule that says states can’t withhold Title X federal family-planning money for reasons other than a provider’s “ability to deliver services … in an effective manner.” In other words, it says states can’t deny providers like Planned Parenthood funding just because they perform abortions. Ernst just promised to introduce a bill undoing that — plus, she wants to send Planned Parenthood’s funding to places like crisis-pregnancy centers.